On the 16th of October at the site of the exhibition "Through space and time" was held the first meeting with the rector of Polotsk State University Ernst Mihailovich Babenko. It should be noted the uniqueness of the event since citizens not often get the chance to learn more about the development of higher education in Polotsk from Ernst Mikhailovich. 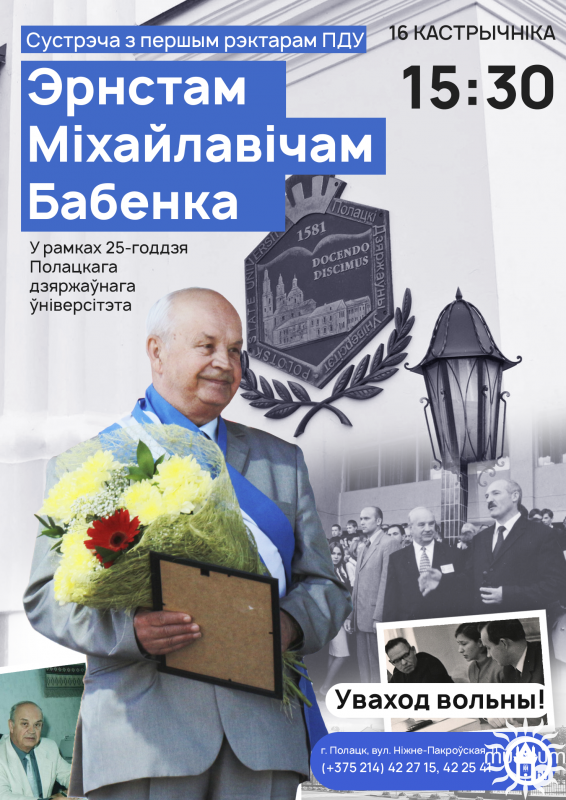 Honorary citizen of the town of Polotsk and Novopolotsk talked about the thorny path which he had to overcome and the future of the university on the way to becoming, on how to support the Belarusian culture and politics has given considerable impetus to the development of the ideas embodied in the period of formation of Polotsk State University. The experience gained in the field visit by the US University, helped future Rector to understand the importance of focus of highter education on the needs of country and the region. Building on this experience Ernst Mikhailovich decided to improve and substantially enhance the ability of the highter education in Polotsk region. Still existed at Novopolotsk Polytechnic Institute naturalistic framework provides the basis for the study of this area in the future, but the humanitarian vector development occurred almost from scratch. Attract a new university renowned experts in the field of history, philology and other humanitarian sciences powerful base was established at the university, the results of which can be seen today. Humanities education of high quality required and the special atmosphere of the importance of the study of the history of Belarus. This can be achieved only in a historically significant site. And this place was the former Polotsk Jesuit Collegium, the walls of which today placed the department of history, philology, tourism and information technology. Ernst Mikhailovich has not bypassed and the people who stood in the origins of humanities PSU - these are the first teachers of the faculty and its outstanding graduates, high scientific results which boasts a university. Those present at the meeting at the Museum, teachers and staff of PSU expressed gratitude to Ernst Mikhailovich for his contribution to the development of education and science, his desire to act and to develop the university has become a matter of life for many. At the end of the meeting Ernst Mikhailovich wished the students success in their studies and future careers, as well as to honor and build everything that has been created by them.